Hollywood recognizes the appeal of police work, war, romance and the old west. These enduring topics find themselves subjected to the big screen year in and year out, and enjoy popular appeal to those who eschew the high tech mayhem that appears to be the preference of movie goers lately. Sharon and I attend movies quite frequently, and look at each other with nothing short of astonishment at the trailers for most of the schlock being proffered these days. We are, admittedly, stuck in a time warp and still enjoy a good, old fashioned western, whether it be a romance or action oriented offering. Our preferences have led to this piece that explores cowboys, and yes Mildred, they still exist! First a disclaimer. I am not a real cowboy, although I have flirted with the notion on occasion. I owned an ornery Appaloosa and cared for a Tennessee Walker, Poco Prince and Kentucky respectively. Naturally I also owned the appropriate tack, a well worn saddle bought from an out of luck cowboy who desperately needed to sell to fund his divorce, and a newer saddle from a tack store close to home. The old saddle was smooth and supple the newer one a torture device that looked good on a saddle stand but was awful to sit in. I became familiar with horse care and management, the local large animal vet, the differences in forage and feed and a good ferrior, a big strong Mennonite fellow who also happened to be a horse whisperer of sorts. 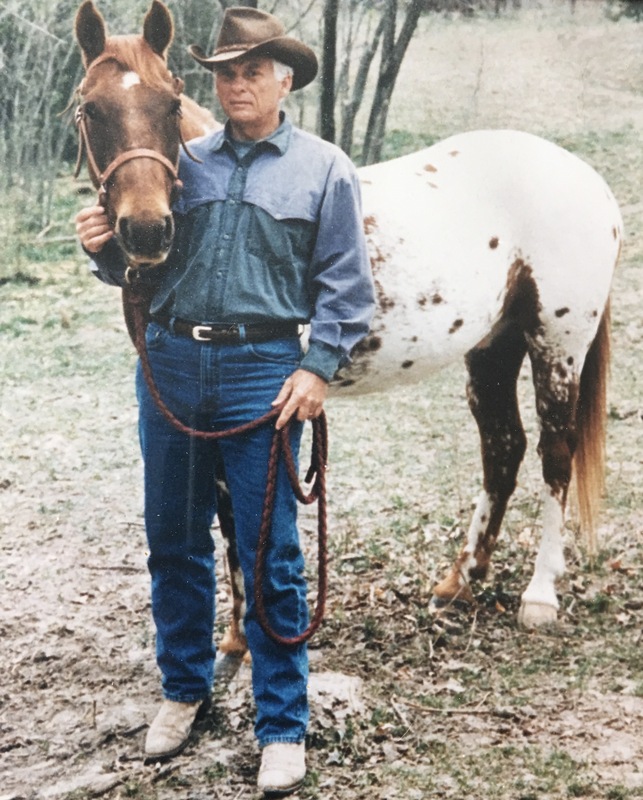 I learned to shovel stalls, vaccinate my horses, and check on them daily to make sure the water tank was clean and filled and they had no particular needs that required attention. I owned a couple of beautiful Stetson hats, and several pairs of boots, my particular favorites being plain old Justin ropers in a variety of colors. My South Carolina piedmont feet are not particularly suited to the exotic, true western boots made out of the hides of various hard to find critters. I developed a basic understanding of halters, bridles and bits and the inordinate amount of time necessary to the maintenance and care of leather. I thoroughly enjoyed my flirtation with this side of life……….but was never a real cowboy. I have known a few real cowboys and believe me when I tell you there is a difference between showing up at a rodeo or any horseback event and riding in them. Real cowboys are fine with replacing the shiny sole dressing on their boots with horse manure. They may step carefully in the stall, but are not offended by an occasional misstep. The smell of hay, mixed with the sweet aroma of manure and dirt replaces a fifty dollar bottle of Polo black and is far more comforting. Real cowboys will tend their mounts before they worry about dinner on any given evening. Real cowboys can say one hell of a lot without saying anything at all. They enjoy a nearly mystical ability to convey profound thought with a simple knowing glance between themselves. Think not? Walk among them and watch their eyes, smiles and subtle gestures as they size you up. Real cowboys view weather, horses, women and open country with reverence. When offended, they will walk away unless the offender steps in the way……….at which time a real cowboy will quickly display the speed and reflexes one must have to manage livestock. Real cowboys see a fence entirely differently than folks who have no experience stretching wire. They know all about corner posts, gaucho and red brand, with an understanding of how it all goes together. They also know that old pick-up trucks, old dogs and old guns have character that has been earned, not awarded. Their gloves, generally cowhide, will tell many stories, each marked with a nick, or a stain whether it be blood, sweat or the strong, black coffee they prefer. They also have the ability to cut a phony out of the herd rather quickly. Finally, overwhelmingly, they tend to be very pragmatic and intuitive. In today’s world, these qualities aren’t found on every corner. My hat is off to this vestige of Americana. I am proud of my cowboy friends and have learned from them all. Thanks Doc, Marvin, Bill and Cal, for letting me into your world. What a hoot! SR; Bill was a good and dear friend of mine also. One time when we were both working on the Highway Patrol initial accreditation he assigned me a complicated and lengthy project. The project was to be handled along with my regular duties and I complained, requesting that he give someone else the project, someone I felt was not as busy as I. Bill just smiled and said “One of the first things I learned in supervisors school was, when you have something important that MUST be done, you give it to someone who is busy. They will always find the time to do it.” I think of that quote every time I remember Bill. The code does endure…..always will!